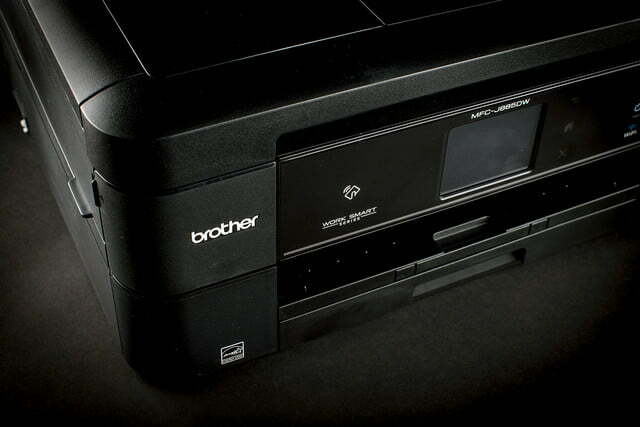 Brother’s budget wonder hits all the high points for any user, and with a low price, too. 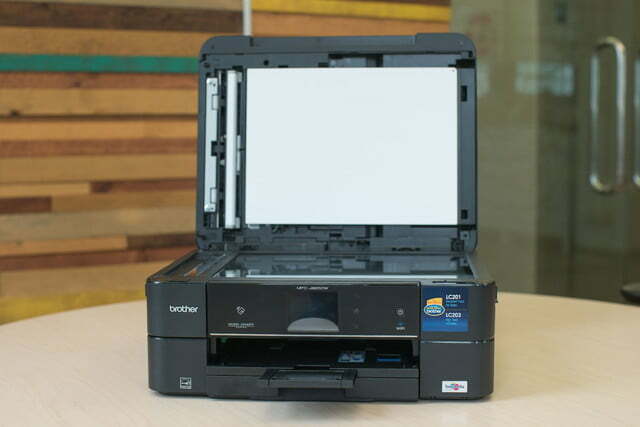 Brother targets its printers toward small business and home office owners, but the low-cost MFC-J885DW ($149 list, $99 on the street as of this posting) hits all the points for any budget user. 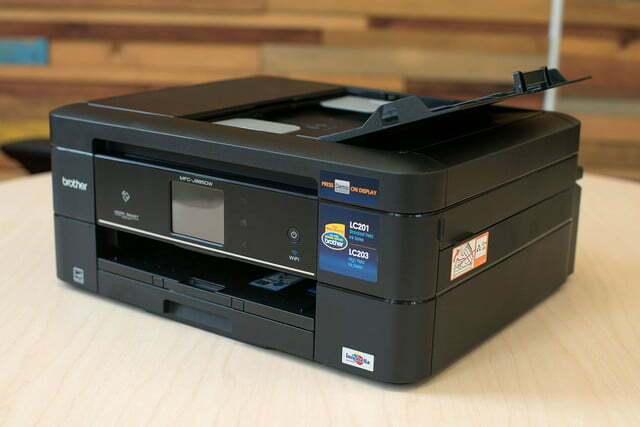 It’s a compact, four-function multifunction printer (MFP, with scan, copy, fax, and print) that doesn’t have a lot of bells and whistles, but it has really good output quality, reasonable print speeds, and duplex printing – things that really matter. 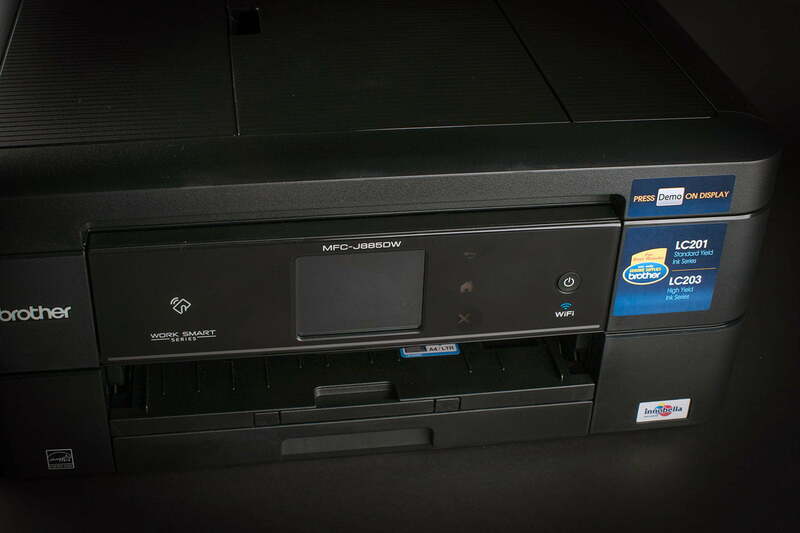 The MFC-J885DW is a perfect choice for someone who is looking for a nondescript compact MFP. 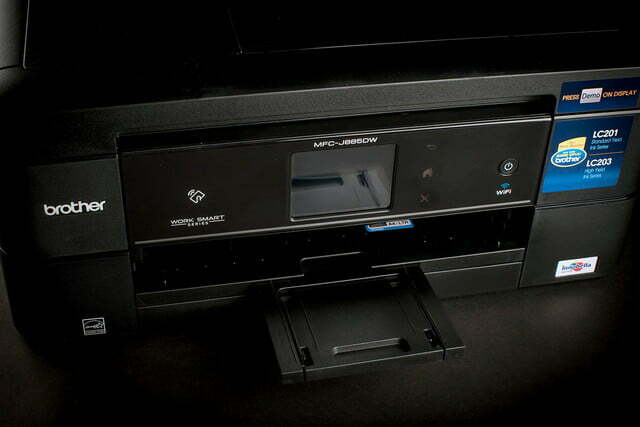 With the 20-sheet automatic document feeder (ADF) closed, the whole thing becomes an understated black box. The J885DW measures 18.8 x 9.8 x 17.9 inches and weighs 16.8 pounds (svelte for an MFP), and there’s a 2.7-inch color touchscreen LCD on the front for navigation and standalone functionality. The J885DW excels in connectivity. Besides USB and Wi-Fi, there’s Ethernet (rare at this price point) and NFC tap-to-print for compatible smartphones and tablets, which are mainly Android devices at the moment. For mobile devices that don’t have NFC, the MFP supports Apple AirPrint and Google Print, Brother’s iPrint & Scan, and Wi-Fi Direct. 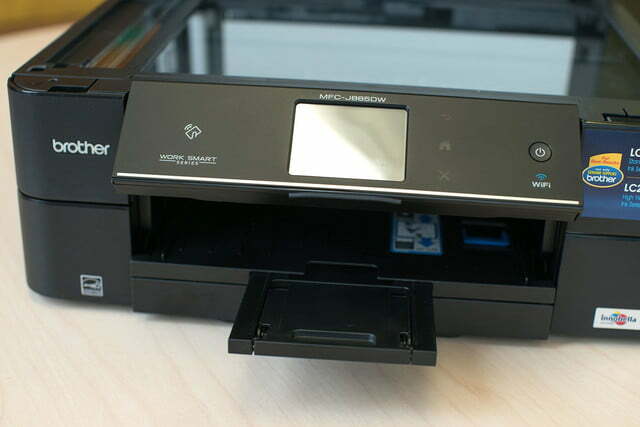 You can also scan to and print from many cloud services including Facebook, Picasa, Flicker, Dropbox, Box, and others. Brother also offers Cloud Apps as well as its online Creative Center for additional print functions. Since it’s a business-centric, four-in-one machine, there’s a telephone jack for the fax. In a weird design choice, the Ethernet and USB ports are placed inside the machine, and are only accessibly by lifting the entire hinged scanner unit. Most users, particular in the home, would most likely utilize Wi-Fi. We were pleased with both performance and print quality. The J885DW has several paper feeds. One is the main paper drawer at the bottom, which holds a paltry 100 sheets of paper (up to legal size). 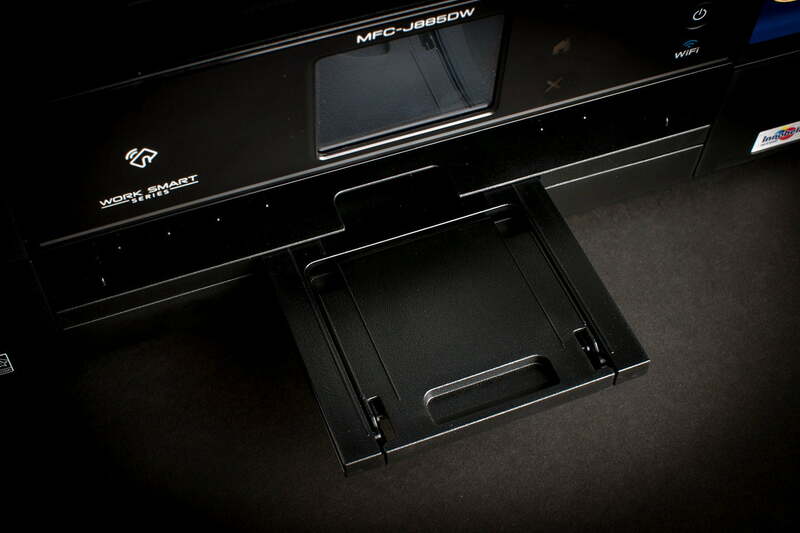 There is a separate feed on the top of this drawer, for up to 20 sheets of small-format photo paper (up to 4 x 6 inches). A rear paper feed is available for heavy media and specialty paper, such as card stock; this feeder is used solely in single-sheet mode. 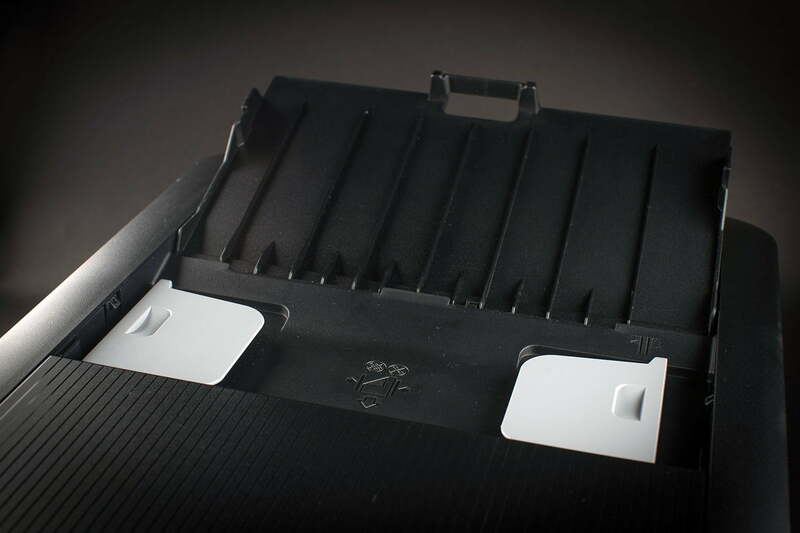 The output support tray, for catching printed documents, has a capacity for 50 sheets. 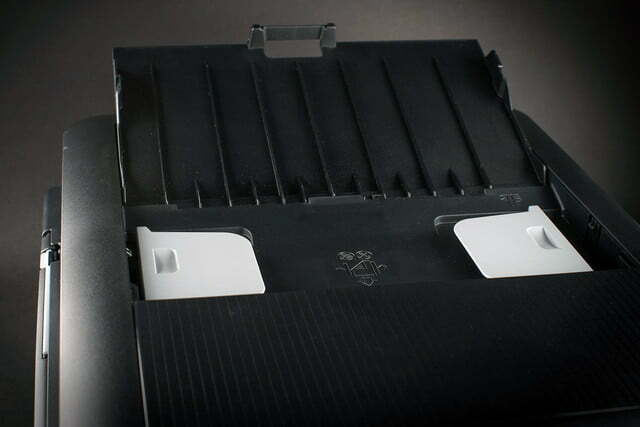 Also located on the front panel are two flip-down covers. The one on the left hides the USB port (used for flash memory and PictBridge-compatible cameras) and SD card slot, while the one on the right side reveals the ink cartridges. 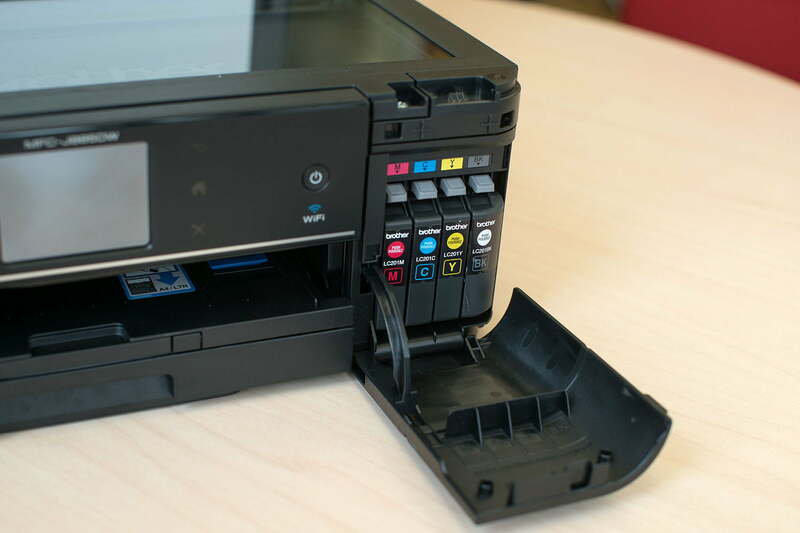 There are two different ink cartridge capacities available. 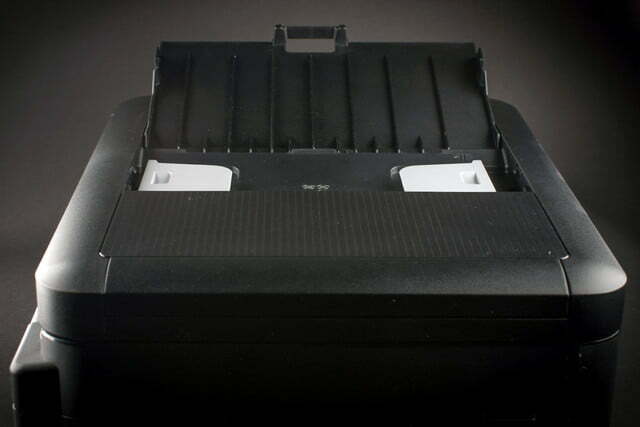 The LC201 standard-capacity cartridges deliver about 260 pages, and cost $12.49 each. Black cartridges usually have a different page yield and price, but the J885DW’s has the same yield and price as the color cartridges (cyan, magenta, and yellow). The higher yield LC2013 cartridges deliver about 550 pages, and cost $24.49 each. There isn’t a big difference in yield between buying two LC201 cartridges and a single LC203; the advantage in buying high-yield cartridges is you don’t have to change them as often. If you know you make a lot of prints, however, you may want to consider getting high-yield three-pack, which will save you some money. 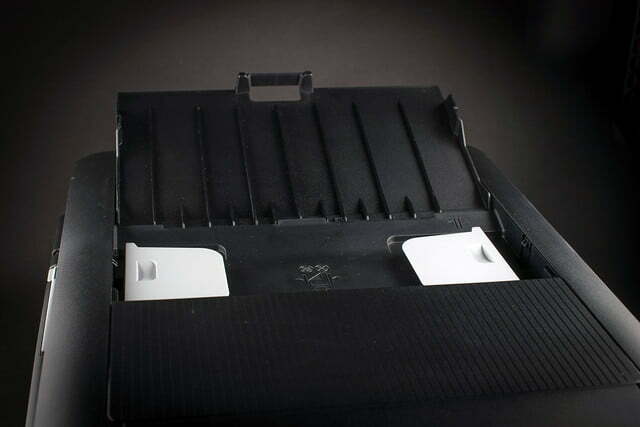 As with most of the MFPs and printers, the J885DW’s packaging isn’t overflowing with goodies. There’s the MFP itself, a box of starter ink cartridges, a setup poster, a 71-page user’s guide, and a setup CD containing drivers and other software. A whopping 645-page manual is available for download via Brother’s website. Not included but available is access to Brother’s Creative Center, an online portal to craft and business projects. The power cord is permanently attached. The J885DW has a two-year limited warranty. 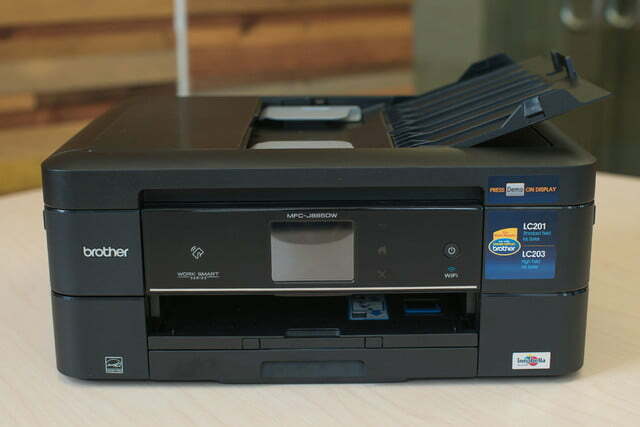 Setup is straightforward: Pop in the CD to install scanner and printer drivers for either Windows or Mac. If your machine lacks an optical drive, you can always download the drivers from Brother’s website or have the OS search for them. 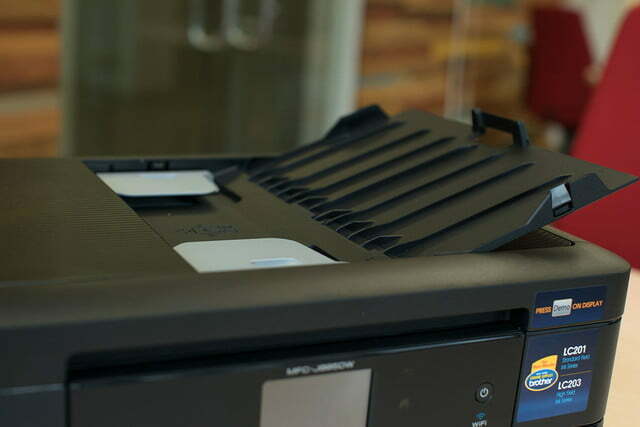 If using the installation software, you’ll be prompted to hook up the USB cable (which we did for our tests) or connect via Wi-Fi, and install the ink cartridges. During installation you can choose to install Nuance PaperPort 12SE (Windows) or Presto! PageManager (Mac) text-scanning-and-conversion software. The MFP primes the inks for several minutes, and then you’re good to go. We are pleased with the MFC-J885DW’s performance. 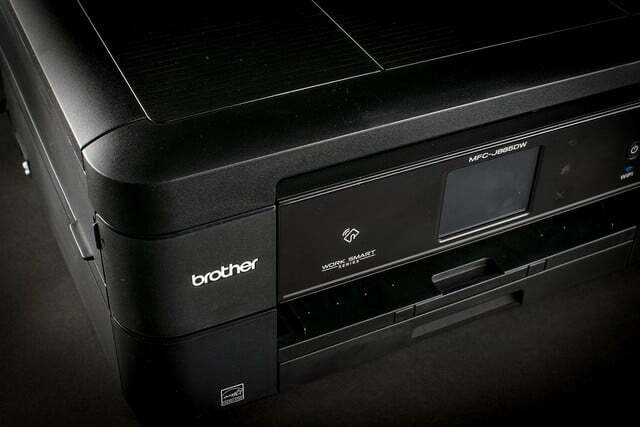 Brother rates print speed at 12 pages per minute (ppm) in monochrome and 10ppm in color. We use a subset of the ISO test with a Word document set for monochrome speed testing and an Excel document set for color testing. With the Word documents, we averaged just under 14ppm – a bit faster than Brother’s rating. With the Excel documents, our print speed dropped to 8ppm. Averaged out, the MFC-J885DW achieved almost 11ppm, which isn’t bad for an inexpensive four-function MFP. The J885DW balances price with useful features and good output. We are also happy with the MFP’s image quality, thanks in part to the use of three separate color ink tanks, versus a single tri-color tank. With Brother’s Glossy Photo Paper, colors are vibrant and accurate; the machine isn’t marketed as a photo printer, so this is a good thing. When we switched to Hammermill Digital Color Copy paper, the output was under-saturated, but that is to be expected with an inkjet printer. Still, for a school or business report, the output is very satisfactory. Very few inkjets function well as a copier. The vendors throw this in as a convenience, and the J885DW is no exception. Copying 10 pages of the Excel spreadsheet was torturous. Granted, the pages had fairly high coverage, but we gave up the test when only five pages had been ejected at the eight-minute mark. For home users who need to make the occasional copy, this isn’t an issue. It’s in a small business environment where you might see this as a hurdle. 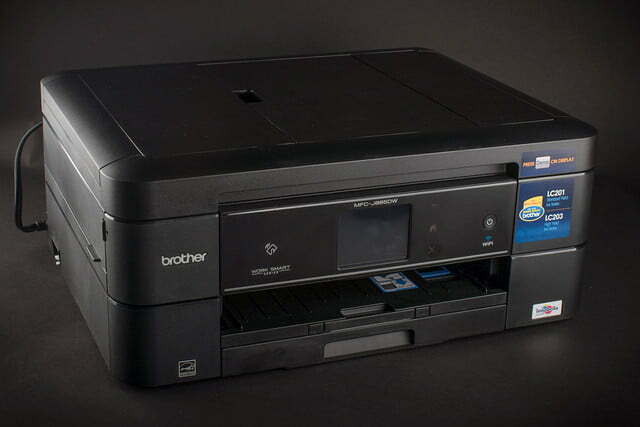 You can print photos with this business printer when using Brother glossy paper. 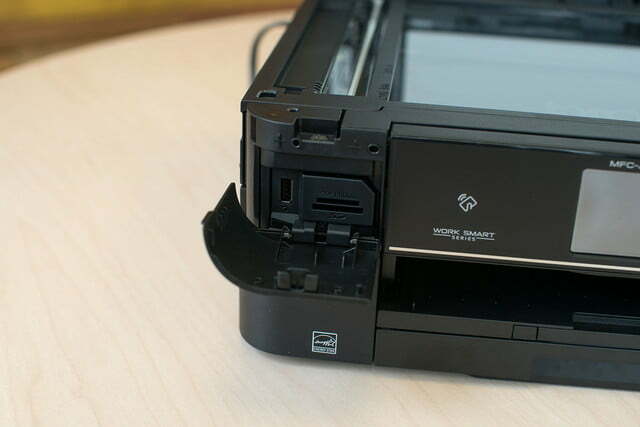 Although the printer is compact, using a stand helps free up space for office supplies. Individually, the high-yield tanks don’t offer cost savings. It’s better to buy them as a three-pack. Brother makes some really nice printers for small businesses and home offices, and the J885DW fits nicely in either role as a budget MFP. Although Brother doesn’t market toward general home use, the J885DW also provides very good output quality for photos and school reports as well. The ability to send and receive faxes will be attractive to some users, but, in a digital world, that’s icing on the cake. 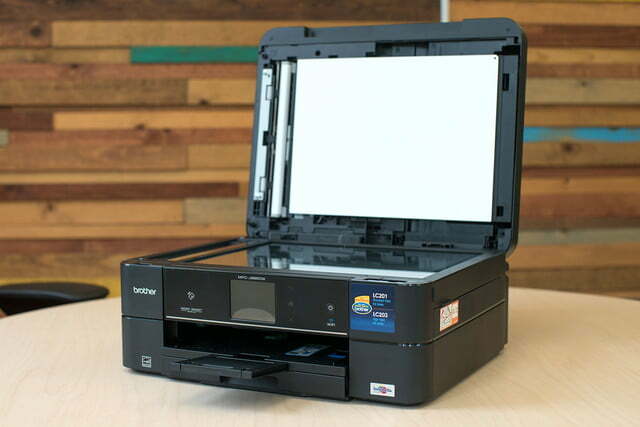 When you combine its features, connectivity options, and affordable price, the J885DW is one to look at if you are in the market for a new MFP or replacing an existing unit.